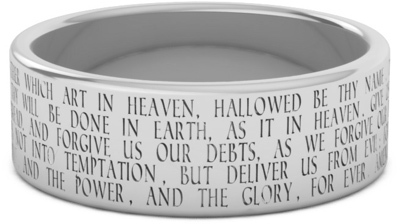 The Lord's Prayer is engraved on the outside of a .925 sterling silver band ring from the King James Version of the Bible (KJV). Available from Apples of Gold Jewelry. The band is crafted in 7mm (shown) or 8mm width and available in both men's and women's ring sizes. We guarantee our The Lord's Prayer Ring in Sterling Silver to be high quality, authentic jewelry, as described above.